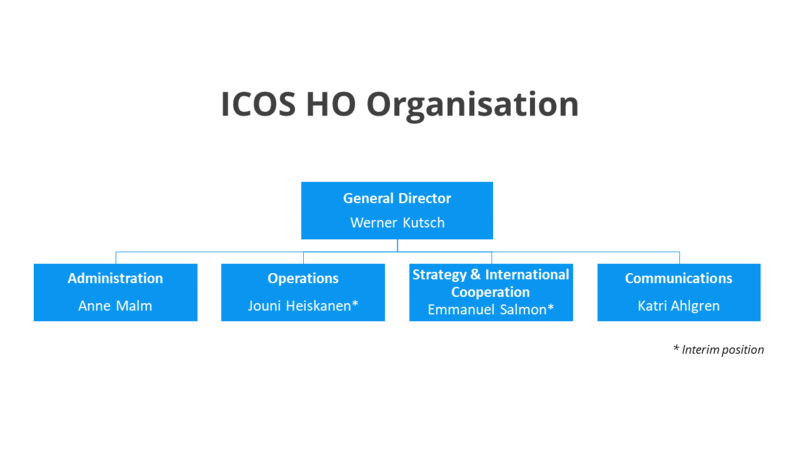 ICOS Head Office organisation changes. The Head of Operations, Eija Juurola has decided to pursue other challenges outside ICOS. Her last day with ICOS will be on February 28, 2019. As a consequence, Senior Scientific Officer Dr Jouni Heiskanen has been appointed as Interim Head of Operations, effective immediately. Eija Juurola will continue in an advisory role, concentrating on knowledge transfer to ensure a transition as smooth as possible. The Operations Unit will continue supporting the RI operations and its scientific development, including the RINGO project. Furthermore, a new Strategy and International Cooperation Unit has been established in the Head office. Dr Emmanuel Salmon, previously Senior Officer, International Cooperation & High-Level Dialogue, will act as the Interim Head of the Unit, also effective immediately. The new unit will handle external relations matters, for example, supporting the association of new ICOS member countries and coordination of the GEO-C secretariat on behalf of ICOS, as well as H2020 projects such as SEACRIFOG and RISCAPE. “Eija has been a core person in the development of ICOS, and she played a key role in the interim phase and the early years of the ERIC. I want to thank her for her invaluable engagement and wish her all the best in the future”, says ICOS Director General Werner Kutsch. The organisation set up now will work as an interim solution, as this is a good time and opportunity to review what kind of Head Office organisation would best support the ICOS research infrastructure. Related to the H2020 projects ICOS participates in, we welcome two new colleagues to the Head Office. Dr Ville Kasurinen joined the Operations Unit as a Senior Officer, Data Analyst from January on. He will contribute to projects such as SEACRIFOG and EuroGEOSS by developing analyses and visual services. Ville started at the EOSCpilot already in August 2018 working for the University of Helsinki but is now joining ICOS. M.Soc.Sci Enni Sahlman joins the Communications Unit as a Communications Officer. This spring, she will support ENVRIplus project working together with ENVRIplus project and Communications Manager Magdalena Brus. Her other major responsibility is RISCAPE communications, including stakeholder mapping and event organisation for the project. Enni Sahlman has previously worked at a communications agency specialising in science communication.